Warm day. Pretty good breeze. And, 40% cloud cover. 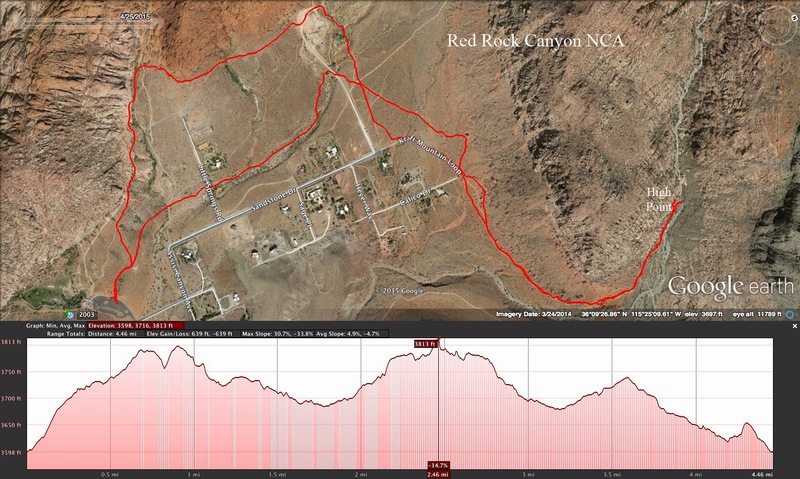 That's what thirteen hikers were dealing with on their 11 mile hike that touched both North Peaks of Red Rock Canyon NCA. We started at the Willow Springs picnic area off of the Red Rock Scenic Loop and hiked up Rocky Gap Road, a 4WD high clearance vehicle road that runs between the scenic loop and Lovell Canyon Road on the other side. As we climbed, the group separated but, at first, the separation was not much. A few times, we stopped to regather. When we reached the halfway-to-the-summit-saddle section, we passed by several redbud trees that were in their prime. We pointed out the trail junction where we would be descending later in the day. This is the first area where the wash and road collide. 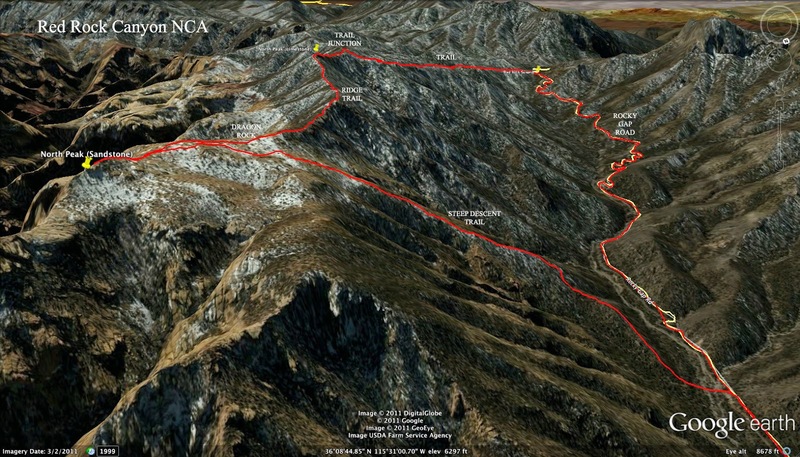 It is a particularly challenging section for the off-roaders that love this ride. After climbing a bit further, we found the second section where the wash and road intersect. Several years ago, the road was completely washed out here. There are some especially mean rocks sticking out of the road bed here as well. With the exception of one shortcut, we stayed on the road. One of the shortcuts has been effectively blocked by volunteers who hope that their efforts will reseed the eroded abandoned road. The last mile or two of the climb kicked all of us but the stronger hikers prevailed and earned a longer rest as the remaining hikers were arriving at the summit saddle. With not a vacant rock left to sit on, we took a break before starting up the trail that leads to the Rainbow Wilderness side of the road. This is a very nice trail filled with limestone, juniper and pinion pine. Views can be seen of the road now far below. After about half a mile up the trail, a hiker turned back to return down the road. That hiker happened to be the writer so the remaining narrative is relying mostly on previous trips along this same route. 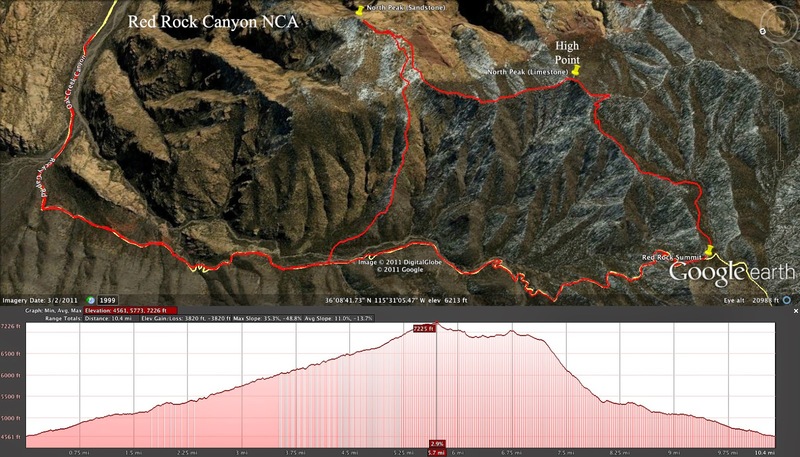 The climb up the trail takes hikers above the 7000 foot elevation range. Often, the higher altitudes make climbing more difficult. This trail is no different. The scenery makes the climb more pleasant and soon, a signed junction is reached. The sign directs hikers to choose either Bridge Mountain straight ahead or turn left for North Peak. After turning left, the trail parallels a limestone ridge to the left with grand views of Bridge Mountain to the right. At the end of the ridge, a small scramble up a limestone peak puts you on top of North Peak (Limestone). Long break number one begins. After the break, another small scramble off the other side takes you down to the ridge trail that connects both North Peaks. This trail is becoming more and more clear as more hikers discover this route. The trail consists of limestone until Dragon Rock, a yellow sandstone jagged rock outcropping appears ahead and to the right. 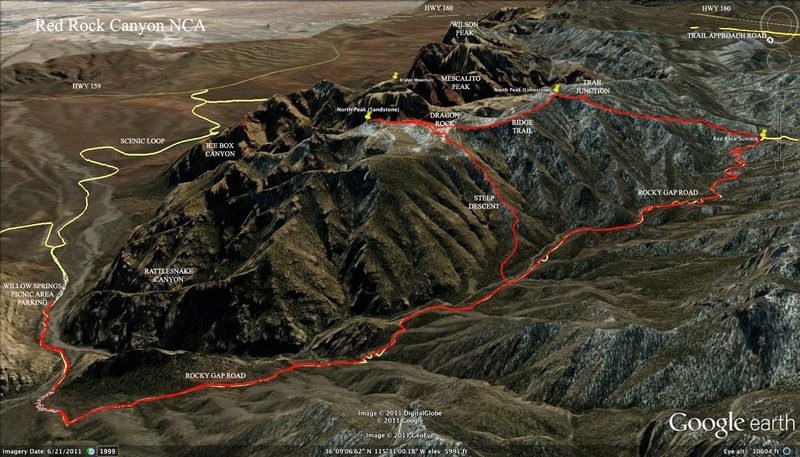 At the Dragon Rock junction, turn right to find the Fern Canyon Overlook Trail; turn left to find the descent to Rocky Gap Road trail; and, follow the ridge straight to find North Peak (Sandstone). The group continues out to the peak climbing over large loose sandstone rocks. A colorful view of the Calico Hills can be seen from the peak. The writer hiked back down the road and reached the descent trail junction 1.75 hours before the group finished their tour. While she waited, she entertained herself watching a black girdle lizard shed a layer of skin. She also found a few fossils! Finally, the group was singing praises that it was approaching the bottom of that very steep and treacherous trail that brings the hiker down from the sandstone area. All together again, we hiked the road down for 2.4 miles to the cars. What a workout!! Well, it had been a while since the writer had hiked Fern Canyon, but she didn't realize it had been that long! 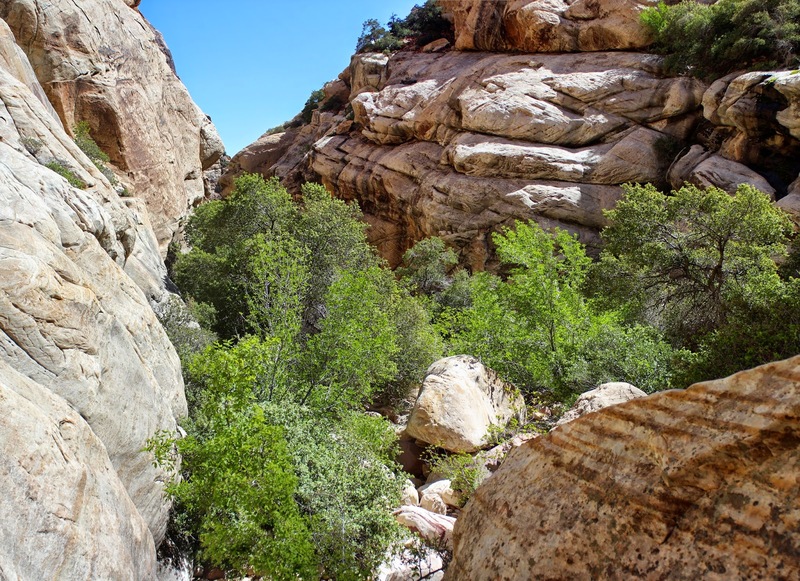 Sixteen hikers came for a hike into Fern Canyon, that is the north fork of Pine Creek in Red Rock Canyon NCA. After waiting for a burro to cross the Pine Creek Trail, we stopped by the Wilson House then headed on down toward Fern Canyon. We missed the trail that turns up the hill to the right and just waltzed right into the south fork canyon without realizing it. 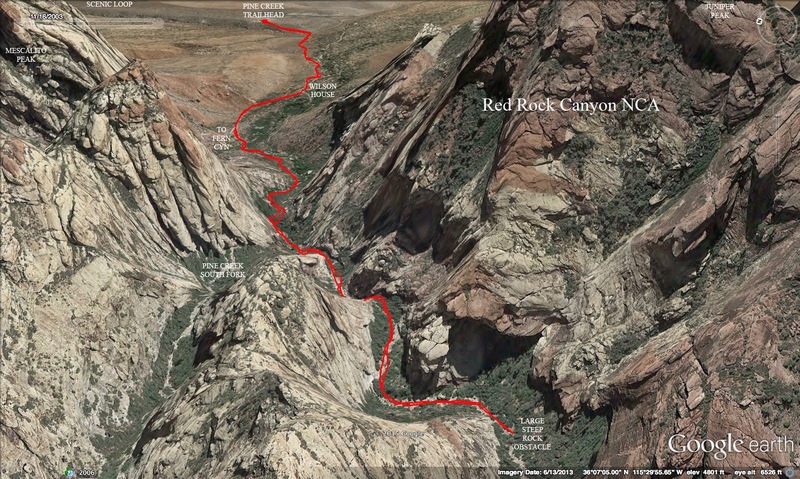 Finally, the boys let Kay in on the route mishap and a hike into the Pine Creek South Fork canyon ensued! Seriously? We're in the wrong canyon??? Everyone laughed and didn't seem to mind the change of plans but we all realized that this canyon would have more difficult scrambling than would have been in Fern Canyon. It was really quite fun to tackle this difficult scramble at our own slow pace. We found our way up obstacle after obstacle. When we couldn't do a scramble by ourselves, one of the men would lend a hand. This looks like a good way. Many of us had not been involved in the Terrace Canyon hike that was held about a month ago so today offered us a way to experience at least part of the Terrace Canyon hike on our own terms. Kitty, are you late for something? We turned left at the first canyon fork (south fork of the south fork!) and stretched our comfort zones as far as they would go. When we reached the large steep boulder that you have to climb up on the left side of the wash, we decided we had had enough. We found a spot to sit ... it wasn't difficult ... and enjoyed our break. In the near distance, we could see the next left fork of the Terrace Canyon hike. We didn't need to go all the way to the terraces to be blown away with natural beauty. It was all around us. Coming down was a little easier as gravity loaned its hand. We were careful not to fall into the "descent dangers" of speed and carelessness. We found the trail that we had come in on and returned almost exactly the same way back to the cars. We will need to schedule another hike into Fern Canyon soon. But, perhaps, someone else would like to lead! Fun, fun, fun! Hallucinogenic Jimson Weed (datura) - Don't Touch! 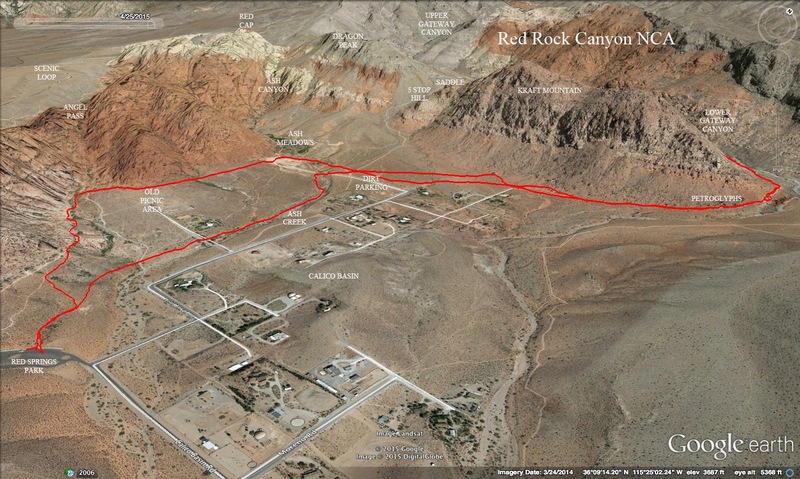 Immediately to the north of the Calico Hills of Red Rock Canyon NCA lies a pocket of private property with a few houses, farms and ranches. Prime property, to be sure! This area is named Calico Basin. Surrounding this pocket, the conservation area has several trails that crisscross the desert between the Calico Hills and Kraft Mountain. A spring, meadow area and small creek can be found within these trails and we call this Ash Meadows. There are several popular trail junctions that can be reached from the Red Springs Park picnic area in the basin. 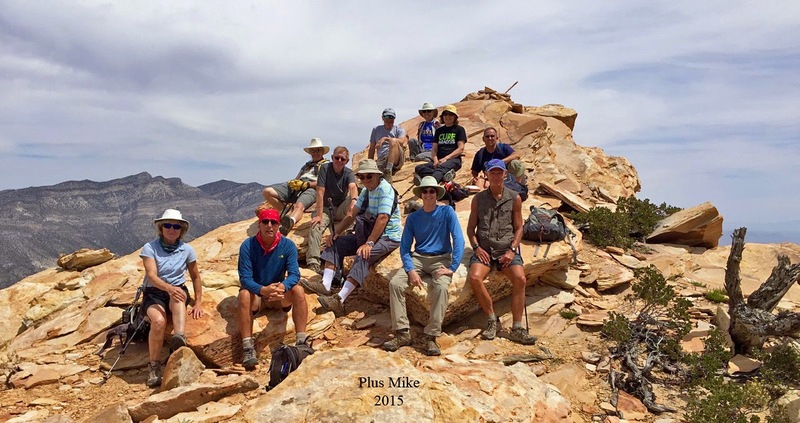 Twelve leisurely hikers started out at Red Springs Park and, after checking out the Jimson Weed that was blooming near the cars, followed the trail up toward the Angel Pass trail junction. Right away, we could see that this would be a "flower" hike. There were more different kinds of flowers blooming right now than there had been all spring. We were on a quest to identify all of them! There is a serious attempt to identify the captured photos in a collage below. There were two other blooms that the writer neglected to photograph. One was a pink fuzzy ball-like bloom which is probably buckwheat. And, the other was a beautiful low-to-the-ground clump of purple flowers that may be notch-leaf phacelia. We dropped down to take a closer look at the rock labyrinth that was constructed at the old home foundation a few years ago. Then we dropped a little further to skim past the lower end of Ash Meadows. There was a decent showing of water in Ash Creek. Here, we started up the trail toward Kraft Mountain. 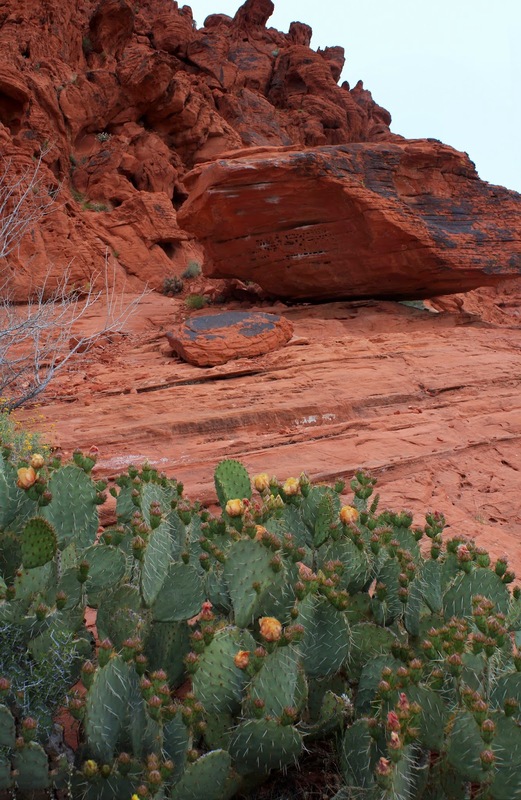 To reach the red and white sandstone mountain, we had to cross over desert terrain. We looked for tortoises as we hiked. Our route took us right by four or five of the large climbing boulders. Each one already had occupants with crash pads below as seen in the photo above. 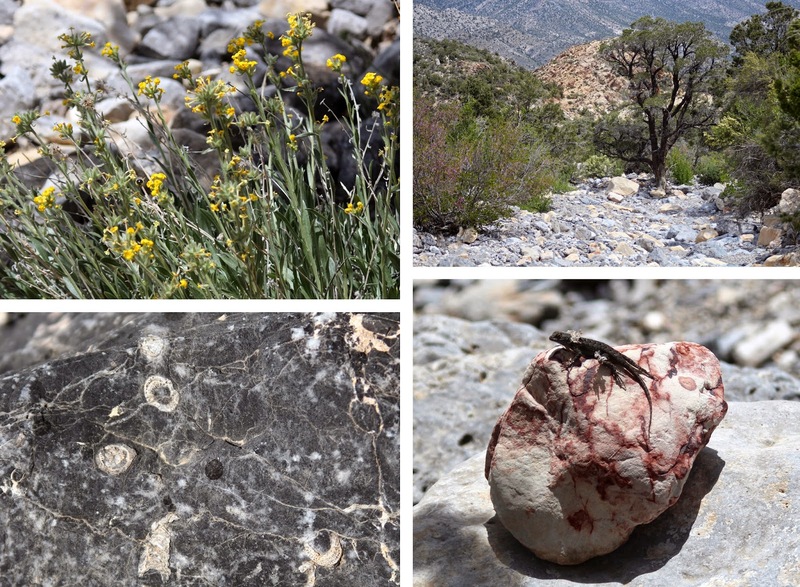 We detoured up to take a peek at the petroglyphs found on a large boulder on the east end of Kraft Mountain. These writings are named the "Birthing Rock" Petroglyphs because they seem to represent a woman giving birth. From here, we continued around the end of the mountain and hiked into the canyon as far as the trail would take us without dropping into the wash. The end of the trail came to an excellent place to explore up into the peak terrain of Kraft. Next time. We took our break then gathered ourselves and started our return. 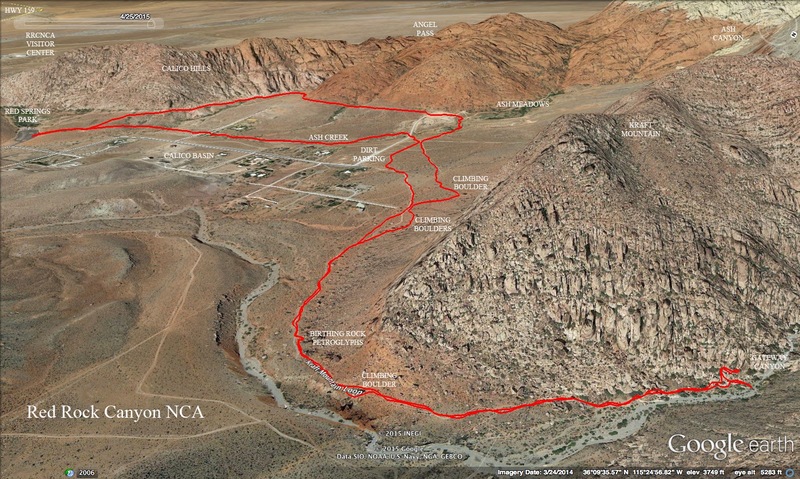 The return route brought us near the dirt parking lot at the end of Sandstone Road, then circled back through the desert terrain until we crossed a small road and dropped down to walk along the Ash Creek Trail. Heading straight back to the cars, we climbed a small hill and dropped down to the parking lot. Very nice hike and pleasant company.